Do the companies who pour more money into digital ads know less people are watching? And if they knew, do you think they might do something? See if these statistics mirror your behaviors. Here are 30 straightforward facts why we are fed up with digital ads. 82% of people have closed a web page because of an autoplaying video ad. 81% of consumers have closed a web page because of a pop-up. 79% of people feel they are being tracked by ads. 77% of people wish there was a way to ad filter instead of ad block completely. 73% of people disapprove of pop-up ads. 71% of people believe digital ads are more intrusive now than they were three years ago. 60% of online traffic is comprised of bots. 57% of people say their pet peeve with digital ads are pop-ups that obstruct content. 51% of people use ad blockers because too many ads are annoying or irrelevant. 50% of people use ad blocker because there are too many ads on the internet. 50% of viewers are irritated by ads that take up the entire screen. 51% of people think less of brands that use autoplaying video ads. 51% of consumers believe websites should host fewer ads. 50% of video ads aren’t seen by a real person. 48% of people would abandon a website or app if it crashed. 47% use ad blockers because ads are too intrusive. 44% of internet users cite two ads as the limit for a website. 42% of consumers are annoyed by pop-ups that interrupt their shopping experience on retail sites. 40% use ad blockers because ads take up too much screen space. 37% use ad blockers to speed up page loading time. 36% of people would never visit a website or app again if it crashed. Only 8% of display ads are viewable by real people. 8% of internet users account for 85% of clicks on display ads. Only 6% of people like ads that re-target them ay digital ads are more intrusive now than they were three years ago. The average person is served over 1,700 banner ads per month but only half of them are ever viewed. Does this sound like you? Do you think companies will start producing better ads or will there be better filters to weed out the one that offend us? Does you company need help creating a better ad experience? Google Adwords is the 800 lb. gorilla of digital advertising. 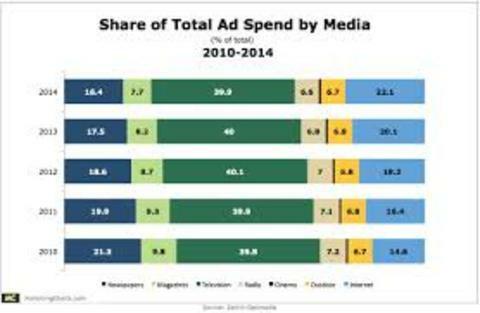 And marketers now spend more on digital ads than television advertising. Google Adwords represents 41% of the world’s $225 billion per year in digital ad spend. About 97% of Google’s total revenues come from advertising. Google revenue growing at 21% a year. Here are 40 Google Adwords stats to guide your marketing strategy. 98% of searchers choose a business that is on page 1 of the search they query. 97% of mobile search spend comes from Google Adwords. 89% of the traffic generated by search ads is not replaced by organic clicks when ads are paused. 80% of global internet users are reached by Google Adwords Display campaigns. 78% of US search revenue is earned by Google. 78 of local searches on mobile result in offline purchases. 72% of AdWords marketers plan to increase their PPC budgets. 70% of mobile searchers call a business directly from Google Search. 66% of buyer-intent keywords are paid clicks. 60% of all digital ad spend comes from Google and Facebook. 52% of people who click on a Pay-Per-Click (PPC) ad go on to call the advertiser. Over 50% of people who search on Google cannot differentiate Paid from Organic entries. 50% higher conversions for PPC traffic than organic. 49% of Google ad clicks come from smartphones. 48% of digital ad spend is paid search. 41% of clicks on a search page come from the top 3 Paid Search ads. 36% of searches on Google are associated with location. 33% of global digital ad revenue comes from Google. 33% of all Google search clicks are generated through mobile. 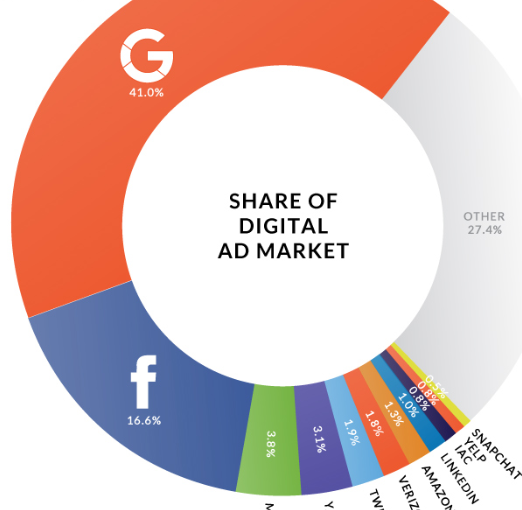 Less than 5% of ad publishers revenue goes to Google and Facebook. 7.94% is the average click-through rate for an ad in the first position. 2.19% is the average Conversion Rate for the Home Goods industry. Over 2 billion bad ads were taken down by Google in 2016. Over 4 million store visits have been tracked from Google Search Networks. 2 million publishers use Google AdSense. 100,000 publishers were removed from Google AdSense in 2016. 1.2 million businesses advertise on Google Adwords. 350 businesses advertised on Google Adwords when it started. 300,000 mobile apps currently serving Google Mobile Ads. $135.17 is the Cost Per Action for the Legal industry. $60.76 is the average Cost Per Acquisition for Google Adwords Display ads. $59.18 is the average Cost Per Acquisition for Google Adwords Search ads. 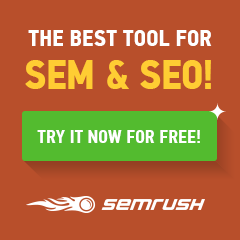 $55 per click is the cost of a keyword using the word, insurance. $6.91 is the Cost Per Action for Dating and Personals industry. For every $1.60 businesses spend on Adwords, they make an average of $3.00 in revenue. In Q2 of 2012, Google’s revenues rose 35% to $12.21 billion. In the same quarter, aggregate paid clicks went up by 42%. AdWords advertisers can now target by Congressional District. Amazon is the largest Google Adwords advertiser. Facebook is a distant 2nd at $36 billion in ad revenue in 2017 to Google at $74 billion. If you want to know how Adwords and the Google Ad Auction works, below is an infographic that explains it. Do these stats teach you something new about Google Adwords? Do you think your business benefit from Google Adwords? 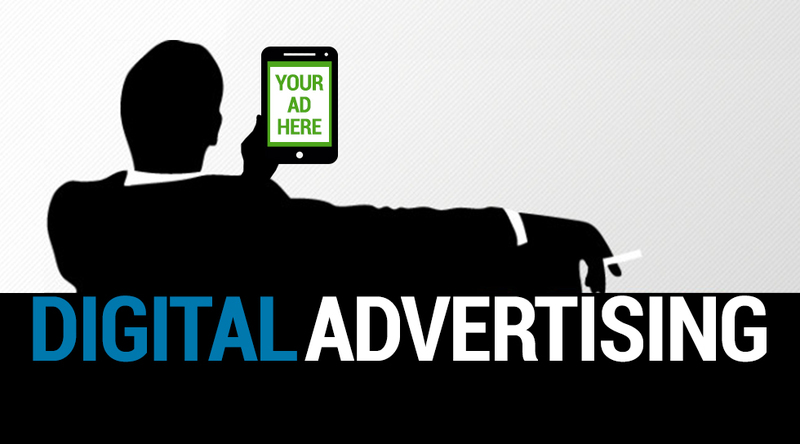 Digital advertising trends show digital is now the largest advertising channel in the U.S. 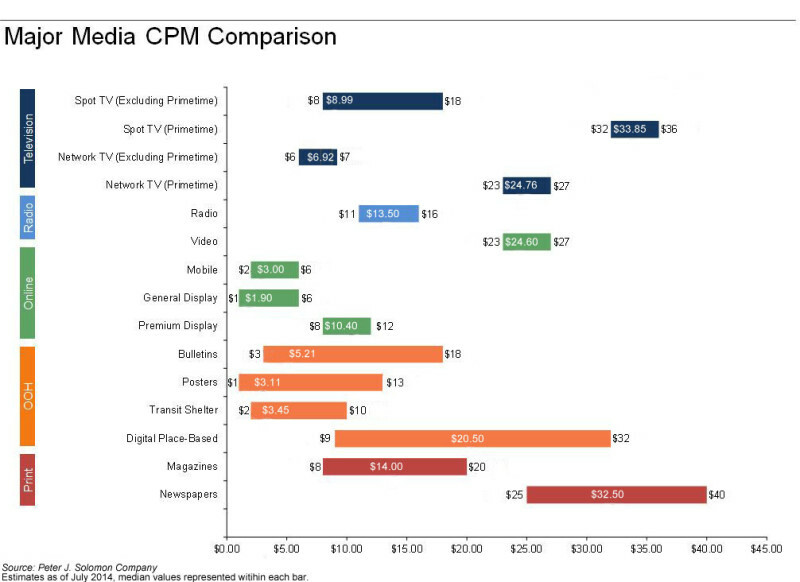 Advertisers spending $60 billion dollars a year. Digital advertising is expected to be the largest advertising channel in the world this year with advertiser spending $202 billion dollars. Growth isn’t slowing down, either. The uptick in growth is 20% versus year ago with social growing at 55% and mobile at 66%. Proliferation abounds from new social networks, native ads, ad blockers, mobile ads, outsream videos, instant articles, programmatic advertising platforms and chatbots. To explain what you should know and what your business should do, Jomer Gregorio, Owner at Digital Marketing Philippines, created an insightful inforgraphic. Here’s the summary, 7 biggest digital advertising trends for 2017, followed by the infographic which goes into greater detail. AD BLOCKERS: In 2014, 15% of internet users in the U.S. used ad blocking software; it is 26% in 2016. In 2017, more digital advertising channels are expected to offer subscribers and viewers an ad-free experience, if they pay for it. GOOGLE AMP AND FACEBOOK INSTANT ARTICLES: Mobile users are growing at a very fast rate and, with that growth, there is greater demand for faster loading speed and better consumer experience (UX). Google AMP and Facebook Instant Articles unveiled new platforms to reduce latency of loading. And you can bet they will be looking to monetize them. FLAT DESKTOP AD REVENUE; EXPLODING MOBILE AD REVENUE: For the first half of 2016, digital advertising revenue scaled to $32.7 billion. Mobile ad revenue grew at 89% and represented 47% of total. Desktop revenue dropped -13%. GOOGLE AND FACEBOOK CONTINUE TO RISE: In 2016, 78% of growth in digital advertising went to Google and Facebook. It is expected Google and Facebook will account for 61% of digital ad revenue by 2018. PROGRAMMATIC ADVERTISING ALSO CONTINUES TO RISE: Programmatic advertising reefers to automated systems and data that media buying decision without human interference. The strategy for advertisers is a cost-effective way to promote their brands online with extreme precision. The IAB estimates that programmatic spending will grow to over 80% by 2018. MORE OUTSTREAM VIDEOS: Outstream Videos are a new type of ad format that allows publishers to to show video ads in the text line breaks and corners of web pages. 77% of digital ad agencies say Outstream Videos will be critical to their client’s success in the coming years. CHATBOT INVASION: WhatsApp, We Chat and Facebook Messenger are the leading messaging services. They are outpacing some of the biggest social networks in terms of monthly active users. As of now, 18,000 bots have been developed to help brands offer streamlined, individual service through chats. Here is fuller explanation of what to expect in the infographic. Are you aware of these digital advertising trends? Are there any other you would include? Trends indicate leading brand companies are moving ad spending to digital, but the question many still ask is: Does digital advertising really work for brand advertisers? To answer this question definitively, the IAB through Peter Minnium, Head of Digital Initiatives, asked BarnRaisers to help them research this area and create the infographic featured at the bottom of this blog post. So, if your company is asking, now you have an answer that has been researched, has proof-positive and an interesting visual. Here are 8 studies that prove digital advertising works for brands. 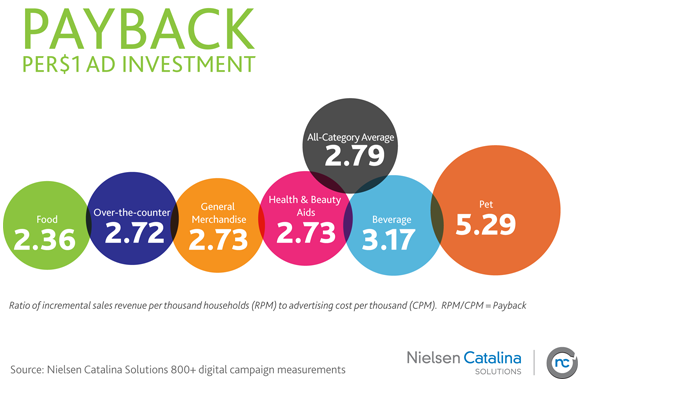 DRIVES SALES AND ROI: Nielsen completed more than 800 studies over the past seven years, collaborating with more than 300 CPG brands and 80 companies to measure the correlation between online advertising and offline consumer purchases. EFFECTIVE ACROSS THE ENTIRE CUSTOMER JOURNEY: Automakers are sophisticated users of digital media, so McKinsey analyzed 24 customer touch-points for more than 9,000 new car buyers to better understand which points of engagement drive customers’ premium perceptions and purchase decisions.Not only did they find that digital is key to driving premium perception (second only to live experiences), they discovered that digital channels dominate the path-to-purchase (in this case, McKinsey’s automotive “consumer decision journey” [CDJ] framework).With traditional media, brands were constrained in their ability to influence prospects across the entire journey and to do so in a granular, discrete manner. Not so with digital media. Recommendations have more impact on a consumer’s purchase decision than both brand and price – 57% of decisions are based on this. Online shares are almost as valuable as in-person recommendations – a consumer is 9.5% more likely to buy a product with an excellent shared recommendation compared with 10.6% more likely via an excellent in-person recommendation. In contrast, a negative recommendation can reduce purchase intent by 11% for an online share and 11.2% for an in-person one. The specific value of a share can be determined by measuring how much more a consumer will pay for a product if they have had an excellent online recommendation (via sharing). ShareThis calculated a delta of +$3,708 for a family size car, +$24.91 for tablets, and +$0.92 for household goods, for example. DRIVES INTERACTION AND LIFTS BRANDS: It is well known that the quality of ad creative is the most important determinant of ad effectiveness. A seminal comScore ARS study showed that creative quality drives more than half of the sales changes for brands analyzed, four times higher than the impact of the specific media plan. Digital creative adds the dimension of interaction to sight, sound, and motion – and greater interaction has been shown to drive brand effectiveness. For example, IAB, comScore, and Vibrant Media partnered to study the effectiveness of mobile advertising for Oreo, Hellman’s, and Microsoft Windows Phone. 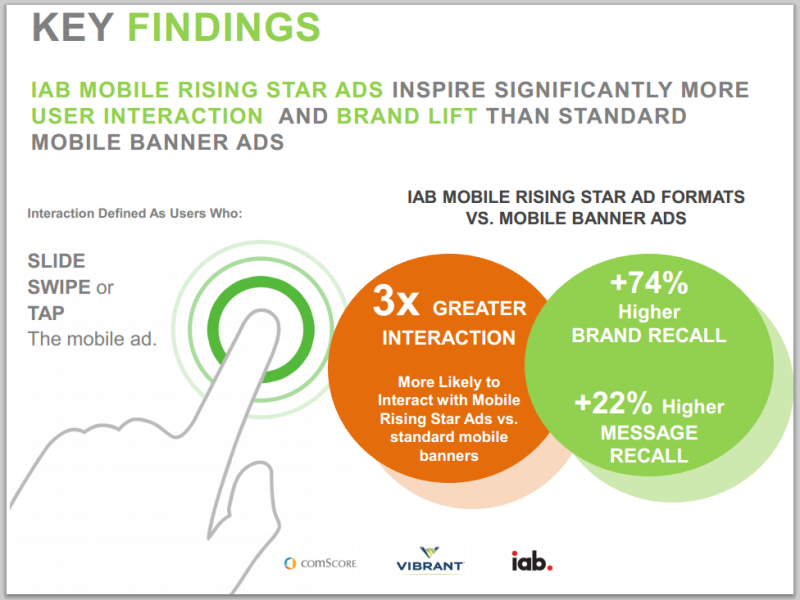 Standard banners were compared to the IAB Rising Stars, which include interaction.Results across the three ad campaigns show that consumers are twice as likely to interact with a Mobile Rising Star ad as a standard mobile ad and have higher brand lift after interacting with a Mobile Rising Star ad (83% more likely to have an improved impression of the brand, 74% to recall the brand, 22% to recall the message, and 12% to recommend the brand). IS MORE EFFICIENT THAN TRADITIONAL MEDIA: While it is dangerous to generalize about media costs given the wide array of choices within each medium, digital advertising can generally be seen to be among the most efficient means of reaching an audience. Further, on a cost-per-conversion basis, the IAB estimates digital to be five to six times more efficient than direct mail. IS ESSENTIAL TO REACHING AN AUDIENCE: In 2013, time spent with digital media among U.S. adults surpassed time spent with TV, and this gap will likely continue to widen.U.S. adults are estimated to spend 4 hours, 28 minutes per day in front of their TV. 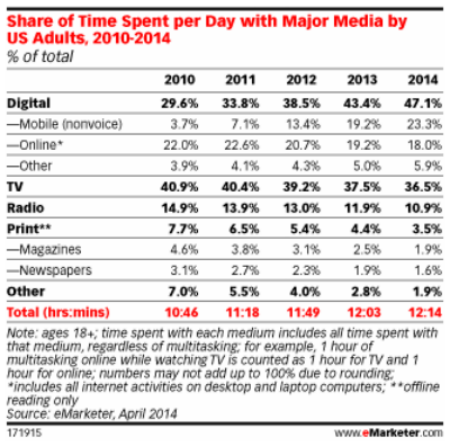 Combining online and mobile devices, however, U.S. adults are expected to spend 5 hours, 46 minutes with digital media daily this year, increasing digital’s lead over television to well over one hour per day.In 2013, time spent with digital media among U.S. adults surpassed time spent with TV, and this gap will likely continue to widen.U.S. adults are estimated to spend 4 hours, 28 minutes per day in front of their TV. Combining online and mobile devices, however, U.S. adults are expected to spend 5 hours, 46 minutes with digital media daily this year, increasing digital’s lead over television to well over one hour per day. IS EVEN MORE EFFECTIVE THAN WE KNOW: It is highly likely that the tools used to measure return on investment for media today undervalue digital media. 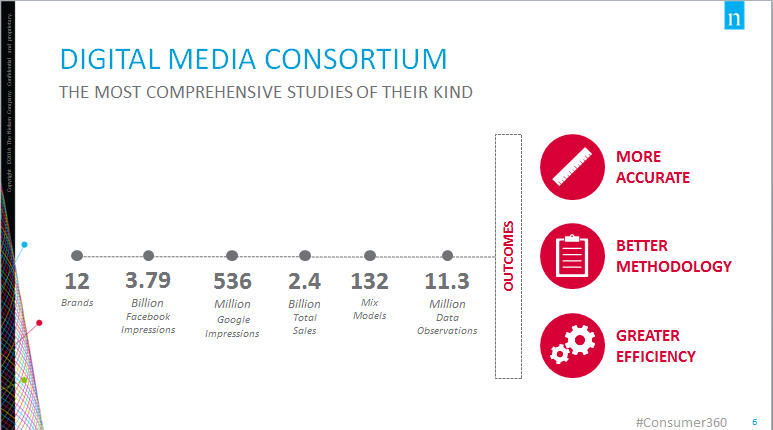 A consortium consisting mainly of leading CPG companies undertook a study together with Nielsen to better understand media attribution. Consortium members, which include Procter & Gamble, Unilever, Nestlé, Kraft Foods, Mondelez, Kimberly-Clark, and Kellogg, found marketing-mix models undervalued digital ads.For example, the ROI from Facebook ads were underestimated by as much as 48% and Google search ads by as much as 39%. We appreciate the IAB getting to a definitive answer on this subject. And their use of our infographic below. 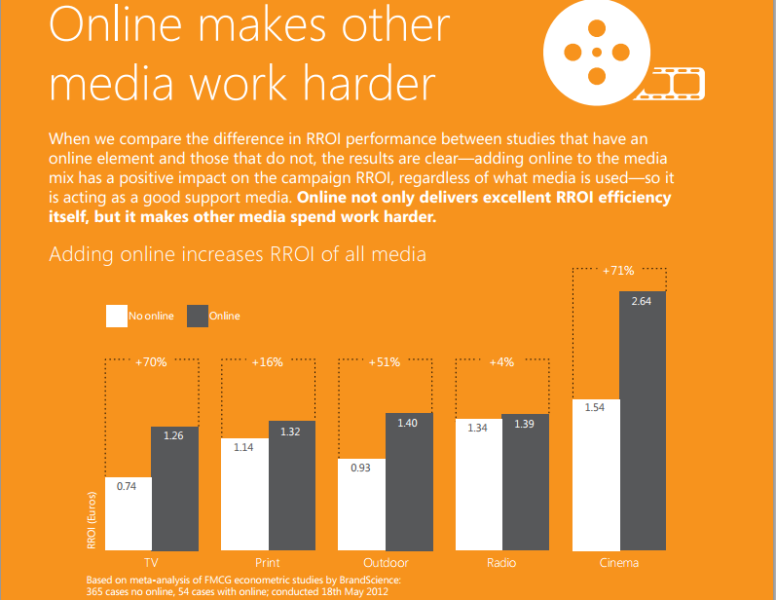 Do these studies convince you of the effectiveness of digital advertising for brands?